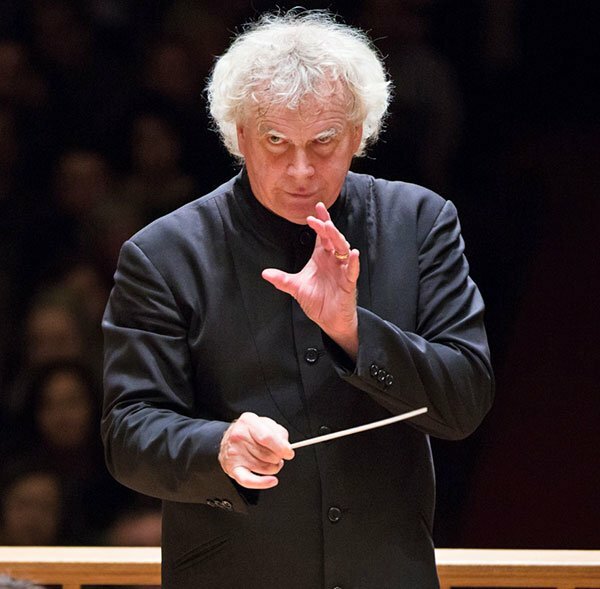 In 1999, Simon Rattle, guesting with the Berlin Philharmonic, led a performance of Mahler’s Seventh Symphony that was so well received, it’s thought to have clinched his subsequent appointment as the orchestra’s new chief conductor. Rattle is stepping down from his position in 2018, so it’s appropriate that the Seventh was the headliner at his Celebrity Series concert Friday on what will be his last visit to Boston with the Berliners. Suffice to say he went out with a bang before a sold-out Symphony Hall. The appetizer on the bill, as it was in 1999, was the original 1965 version of Pierre Boulez’s Éclat, a 10-minute work for 15 instruments, all with different reverberation times. One obvious link between Éclat and the Mahler Seventh is the presence of mandolin and guitar in both. More to the point, I think, is that the experience of listening to Éclat prepares you to listen to the Mahler, to think about textures and colors, to detect harmonies that are implied rather than expressed. The piano, jittery and sometimes violent, dominates the early going; its outbursts are answered mainly by harp, cimbalom, xylophone, and glockenspiel. Halfway through, there’s the hint of a dreamy waltz and then, from the tubular bells, a church chime, both right out of Mahler’s sound world. Gradually, the piano slows, talks less and listens more, and the shorter-reverberation instruments assert themselves: alto flute, English horn, trumpet, trombone, viola, cello. Eschewing his baton, hands carving the air, fingers pointing this way and that, Rattle led the piece as if he were moderating a panel discussion with the utmost respect for everyone’s sensibility. Not only was the result crystalline, it had character, the tone set by Majella Stockhausen’s almost jazzy piano. The word éclat implies a kind of explosive brilliance, and that was evident. The Seventh followed after a brief pause for late-comers to be seated. It’s always been the Cinderella of Mahler symphonies, perhaps because, in place of heroic striving, divine reassurance, or death-defying angst, we get irony and humor. He composed the two Nachtmusiken, movements two and four, in 1904, hard on the heels of his Sixth Symphony; the remaining three movements came in 1905. The Seventh begins, over a funereal syncopation in the strings and winds, with the enigmatic song of a B-flat tenor horn, whose military-band origins remind us that Mahler grew up within earshot of a barracks. Mahler himself described this instrument in terms of a stag belling; to me it seems more to anticipate the “Werbung” (“wooing”) call with which Rilke’s Seventh Duino Elegy opens. Whatever, it’s clear that the symphony is a passage from dusk into deepest night and then on to dawn and the light of another day. The initial march of the wild things, with its whooping French horns, comes to a brief halt at a moonlit meadow (not unlike the one in the first movement of the Sixth), then roars on. The first Nachtmusik is a ghostly, desultory night patrol that encounters a waltzing cello, a Gypsy encampment, and a few stray cows. Sleep brings the dreams of the “Schattenhaft” (“shadowy”) Scherzo, a slithering, skeletal danse macabre that, with its funhouse mirrors, is more spooky than scary, though at the end there’s an unnerving parody of the discarded Blumine movement from Mahler’s First Symphony, as if the composer were still haunted by a lost young love. Mandolin and guitar make their appearance in the second Nachtmusik, a stylized aubade that shakes off the dark with some difficulty. And what does day bring for the director of the Vienna State Opera? Orchestra rehearsals! The last movement — whose “Allegro ordinario” heading gives the game away — is a rondo whose allusions to the Prelude to Wagner’s Die Meistersinger von Nürnberg keep getting interrupted by a parody of “The Merry Widow Waltz.” Cowbells and church bells enter the mix, the Janissaries of Mozart’s Abduction from the Seraglio have a cameo, and finally the march theme from the first movement, seeing what fun everyone else is having, muscles its way in, and a symphony that started off in E minor somehow winds up in a jubilant C major. That doesn’t stop the orchestra of this very postmodern finale from making a mess of things: it modulates from C to A-flat at the first “Merry Widow” reference, and at the climax it lands on the wrong note before correcting itself. Laughter is as appropriate as applause. Rattle made a live recording with the City of Birmingham Symphony Orchestra in 1991 (the same year he performed the Seventh with the BSO). The strings are quite backward; that may be the fault of the acoustic, but there’s also some dragging and swooning. Balance was, for the most part, not a problem Friday at Symphony Hall, and the interpretation was less fussy and more straightforward. Rattle’s tempos in this symphony have never been eccentric; here as in 1991, the two Nachtmusiken were a little quicker than usual, the Scherzo a little more relaxed. The violins were seated antiphonally, so that they could converse back and forth; this is the arrangement that Mahler was familiar with and composed for. In their recordings of the Seventh with Bernard Haitink (1992), Michael Gielen (1994), and Claudio Abbado (2001), the Berliners’ refinement sounds almost polite. That was not the case with this performance. Rattle is scrupulous about Mahler’s tempo and dynamic markings; where the Seventh is meant to be vulgar, it was vulgar, though never coarse. Brass outbursts were rich and full-bodied, and he gave the percussion full rein. At times Rattle can seem too scrupulous. There are places in the first movement — before the return of the tenor horn at bar 31, before the arrival of the second theme at bars 114-117, and again before the return of the tenor horn in the development, at bar 193 — where Mahler indeed marks the music to slow, but the result here sounded self-conscious rather than organic. And though the French horn outbursts at bars 245 and 247 of the second Nachtmusik are marked ff, they drew undue attention to themselves. What I really missed about this Seventh, however, was a point of view. You can find just about anything on recordings: swift and light-footed (Rafael Kubelik); devilishly exuberant (Leonard Bernstein); harrowing and redemptive (Klaus Tennstedt); glacially hypnotic (Otto Klemperer, taking 100 minutes as against the normal 75 to 80). I’m not sure what Rattle was looking to say. In the opening movement’s development section, the lyric second theme tries to steer the march theme toward the paradisal meadow, and after a protracted struggle, it succeeds. There was no struggle here: Rattle pulled the tempo back from the initial trumpet fanfares at bar 255, so when the music reached its B-major goal, there was no sense of arrival. (The playing, however, was truly paradisal.) The first Nachtmusik didn’t convey the humor of a meandering military patrol; the cowbells, from offstage, were distant to a fault, and the Gypsy music (or is it a Jewish wedding?) could have been more seductive. The scurrying Scherzo was barely spooky, never mind scary; at least the appearance of Blumine in the trombones at bar 417 was “Wild,” as marked, and the piccolos gave it the right circus flavor. But if Rattle occasionally missed the forest for the trees, they were still breathtaking trees. He gave the winding-down conclusions of the inner movements rapt attention. The refrain that runs through the second Nachtmusik, its portamento verging on parody, can quickly cloy; here it was expressive and yearning. And Rattle underlined the humor of this “Allegro amoroso” by eliciting big romantic swells from the orchestra and then suddenly cutting back to the humble mandolin and guitar plinking away in their serenade. In the “Allegro ordinario” finale, his sly pause at bar 52 led you to anticipate something more majestic than the “Merry Widow” music that followed. He also gave an affectionate dance pulse to the 3/2 “Grazioso” sections where the orchestra leaves off opera and breaks into a Ländler. Has Boston heard a better Mahler Seventh? Probably not. This one was gloriously played and reverently conducted. Perhaps just a tad too reverently. I was inside the hall on Friday night and buckled up for one amazing ride of musikal purity. Simon Rattle was amazing in his direction. The Bolez piece was beyond the ordinary with outstanding musikans playing beyond the call of duty into an abstract dreamland. The Mahler piece was ethereal and transforming in tone and beauty. The playing outstanding and the direction by Rattle beyond compare, poetikal and magnanimous in kind. The performance was a testament to the high degree of art in the Boston music world.